OPLS-AA topology generation is a very complex task because of huge amount of the atomtypes described this force field. 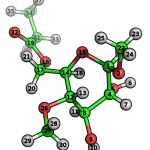 The OPLS-AA force filed contains more than 800 atom types that is nevertheless not sufficient for describing all the diversity of chemical structures. Thus, as parameters for new chemical fragments appears in literature the atomtype database is also extending. TPPMKOP is an utility developed for the automatic topology generation working well with OPLS-AA force field. Below we describe the main algorithm of the atomtype attribution implemented in our TPPMKTOP project. TPPMKTOP is free web-service available on the link: http://erg.biophys.msu.ru/tpp. TPPMKTOP works with MySQL database that contains the force field parameters and information about atomtype attribution. This database is continually upgrading by our research group. TPPMKTOP is opensource project and we can provide access to the latest mercurial version on request (comconadin at gmail.com). where file.pdb is your uploaded file and OPLS-AA is the force field name. Program makes 3 output files: file.itp with standalone topology, file.rtp for making topologies by pdb2gmx, and lack.itp file with missing force field parameter definitions. All the output files, log file and console output become available once tppmktop finishes its work. Let’s consider the details of the topology preparation process for our example molecule. (STEP) First, program prints its internal statistics. Input file format: Protein Data Bank. Forcefield OPLS-AA was found in database. Description: Optimized Potential for Liquid Simulation. All-atomic variant..
1269 dihedrals, 0 nonbonded parameters. In the console output TPPMKTOP prints the statistics of the server database. These values correspond to the total number of atomtypes and bonded interaction parameters defined for the selected force field in the database. Trying to read structure from 'file.pdb'. Here you can check if your atom names, coordinates and element names (it is important!) are attributed correctly. (STEP) Next step is construction of the atom covalent bond matrix (showing what atoms are bonded) that is not printed in log. This step is programmed with openbabel external routines. One can check its work by converting your PDB into SMILES format. Calculating scores for every atom.. finished! Patterns are loading. Please wait.. finished. [OB] Process PAT: [H,C]C(=O)OC having 5 atoms. [OB] Process PAT: ClC(Cl)(Cl)Cl having 5 atoms. [OB] Process PAT: Cl[CX4;$(C(Cl)(Cl)(Cl)Cl)] having 2 atoms. [OB] Process PAT: [+NH4] having 1 atoms. TPPMKTOP tries to match every pattern of the database to the chemical structure of the molecule and constructs an ordered list of fitted atomtypes for every atom. This record means that 3rd atom of the «C-O-[CH](C)-O» pattern (bold) should be defined with atom type with ID 196. This SMARTS pattern describes the following fragment: aliphatic carbon atom bonded to oxygen that bonded to aliphatic carbon with only one hydrogen, one aliphatic carbon and one oxygen that connects two carbons. The choice between two patterns is performed according to the conditional priority («good» attribute): 196th atomtype have 150 score points whereas 140th atomtype have only 100. Thus, the 196th atomtype will be chosen. In the internal enumeration 196th atomtype corresponds to opls_193. (STEP) On this step atoms are grouped into charge-groups according to the database and impoper dihedrals (keeping planarity or chirality) are attributed as well. The algorithm is similar to SMARTS-fitting described above. CHARGEGROUP patterns are loading. Please wait.. finished. Renumbering CGNR according to human-readable style..finished. IMPROPER patterns are loading. Please wait.. finished. Generating 1-4 pairs for FF needs..ok.
TPP will write 0 lack parameters to lack.itp. (STEP) At the last stage tppmktop prints the summary charge of the system. If all atom types are attributed correctly than this charge will equal (or close) to the total charge of your molecule. If some inequality remains you can correct some partial charges manually. Please, correct your charges according to sum: 0.000. 7 opls_140 1 LIG H 3 0.060 1.008000 ; alkane H.
11 opls_140 1 LIG H 6 0.060 1.008000 ; alkane H.
38 комментариев " All-atom automatic OPLS-AA topology generator "
It is known bug of tpprenum program. Simply, do not upload files with high connectivity. Start tppmktop directly. If error still remains, send your PDB to my email and I’ll check your PDB by hands. Now It works properly. Thank you for your attention on this question. Good afternoon. It seems that program is not working for my molecule. …. Dear Nataly, please send your molecule to comconadin (at) gmail and may be we will be able to fix the program and help you in such way. It isn’t working for me. i received this after submitting «Calculation is processing at the server.Calculation was run by you or another user.Starting two simultaneous calculations is forbidden.» i don’t know what it means . Dear Yannick. I write the email to you. I tried this on a small molecule, and the atom-types all look reasonable. However, having downloaded your expanded opls-aa forcefield, I still can’t get grompp to work. It’s choking on atomtypes for thiophene (opls_t568, for example). GREP suggests that these aren’t in any of the patched forcefield files. Did I download the wrong thing, or has the most recent forcefield library not been uploaded to bitbucket perhaps? As a second issue: I was able to bypass the atom-type problem by adding some atomtype entries manually, using the values suggested in your commenting (eg. values for furan). However, I then get a number of problems from grompp regarding bond types, angle types, etc. Several of the bonds and angles used are not included in the #define blocks at the beginning of the generated itp files (e.g. I have a bond entry ‘4 5 dfTPP_bon_11′, but no definition for dfTPP_bon_11. 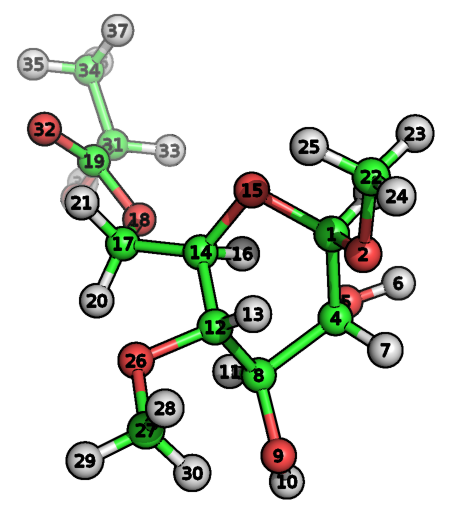 The five problem bonds all have ‘bndTPP_XX_YY’ after them in the rtp file, while the other bonds have no third data item in the rtp. Similarly, a large number of angles are not defined in the itp, and they are the ONLY angles that are present in the rtp. The same is true of dihedrals — if they are present in the rtp file, then they are not #define’d in the itp file. Unfortunately, none of the angles/dihedrals/bonds (e.g. dhTPP_NA_CA_NA_HA) are anywhere in the expanded forcefield, so I cannot manually define them. Finally — there are a handful of #defines that got included in the itp but never used, and the improper dihedrals are included as, e.g. ‘N08 C10 C09 O16 improper_O_C_X_Y’. This causes a fatal error in grompp — I THINK It’s supposed to be ‘N08 C10 C09 O16 3 ;improper_O_C_X_Y’, but am not sure if that’s actually the best way to fix it. Anyways — it does seem like a very useful tool! Just a few bugs here and there, which are probably down to me doing something wrong anyways. Thank you for your report. Thiophene atoms now are commited to external bitbucket OPLS patch. If you does not find some parameters in itp file than you should find them in lack.itp — it means that these parameters were not calculated by anyone or we do not know about it or not yet included them to our ff patch. Sorry for this. We updated the server. Now TPPMKTOP work is recovered. Moreover new version of TPPMKTOP is released. Bug with pairs was corrected and the output ITP now is more nice. It would be great if you could specify what equations are being used along with the specified parameters and also what units they are in. It would be really helpful even if you could guide where to search for them. Bonded interactions are parabolic potential for angle and bond and Rickaert-Belleman potential for dihedrals. You can consult GROMACS reference manual for equations. All energy units are in kJ/mol, kJ/mol/deg^2 or kJ/mol/nm^2. All angles are in degrees. All distances are in nm. Please take care about dihedral zero in your program (trans or cis). GROMACS dihedral zero is cis. This error occurs when try to upload a butane.pdb file. Just a few days ago however the site just worked fine. Perhaps you can help me. I need to produce itp file for my Ligand. I sent a molecule in your topology generator and the files was successfully generated. But, there were some atom types which are not in atomtype of oplsaa such as oplsaa 140a or bf4_b. Are you use a modified oplsaa version? How can I submit my files and get the force field details? Can you help me? «Calculation is processing at the server. even for molecules as simple as methane I get the same error. I don’t thing this is a issue of complexity of the molecule. Can you please take a look at thin? Calculation was run by you or another user . Starting two simultaneous calculations is forbidden. Wait a little and update page -! Your request wil be restarted » even for molecules as simple as methane I get the same error. I do not thing this is a issue of complexity of the molecule. Can you please take a look at thin? Can you please take a look at thin? Thank you so much for your code to generate oplsaa parameters so easily. I had a question about the tolerance setting for dihedral parameters,for instance, dihedral parameters for HC_CT_CT_HC are 0.0 0.0 0.318 0.0 in the original OPLS_AA function(jorgensen1996).By translating OPLS_AA parameters into Rickaert-Belleman potential function,I got 0.66 1.99	0 -2.66	0 0,which are a bit larger than 0.6 1.9 0.0 2.5 0.0 0.0 generated by TPPMKTOP. I prepared topology of my ligand with topolbuild and oplsaa forcefield in gromacs. Will you please take a look at then? Thanks a lot. I was using TPPRenum and received the following error. Can you give me some hints on how to solve it? error: Too many atoms to number. Try to turn HEX mode. HeGood afternoon. It seems that program is not working for my molecule now, but A few weeks ago it worked. Please, if you can help me, it will be great. error: Your molecule have atoms in unrecognized chemical environment. See SMART FIT STATISTICS in your log file for details. You can not proceed topology construction without additional atomtype searching steps. It is recomended to add unrecognized type to DB. If you are not going to modify DB, please try to rerun with —max-bonds. Kindly help me generate the topology file and please tell me about the problem it is encountering. Calculation is processing at the server. away for adding and removing your profits.